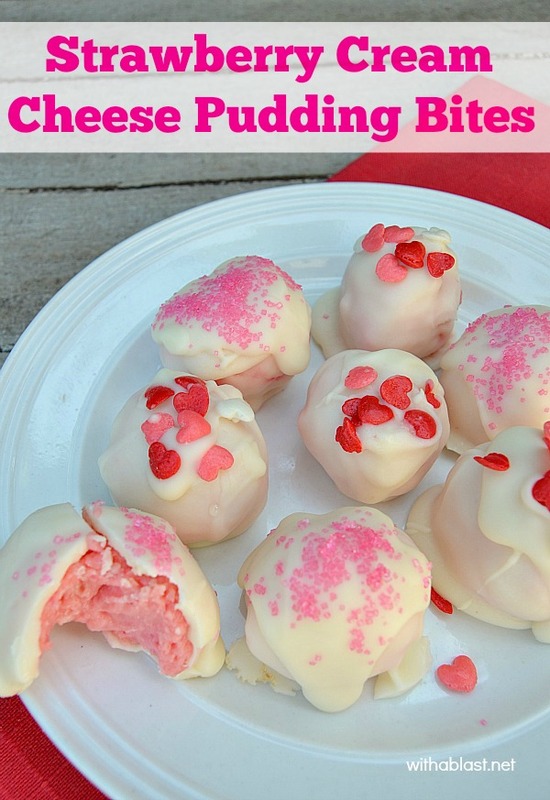 Strawberry Cream Cheese Pudding Bites are not only quick and easy to make, but can be made days in advance, making them the perfect edible gift too. Only one month until Valentines Day ! 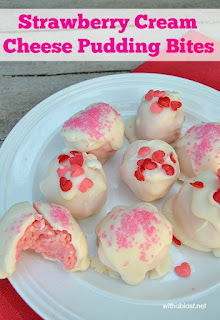 These Strawberry Cream Cheese Pudding Bites are perfect for Valentines Day or as an anytime sweet treat. These absolutely decadent treats are also so quick and easy to make, and you can make them up to 3 days ahead. 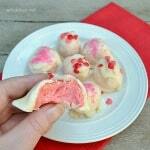 Due to the problems I have with my arms, I find it quite tricky to do something as simple as dipping the cream cheese balls into the white chocolate. But, I have kind of figured out a way by dipping the balls. Setting them on a lined plate and once I finished all 15, I use a teaspoonful of melted white chocolate and poured it over the top – sprinkled and finished ! 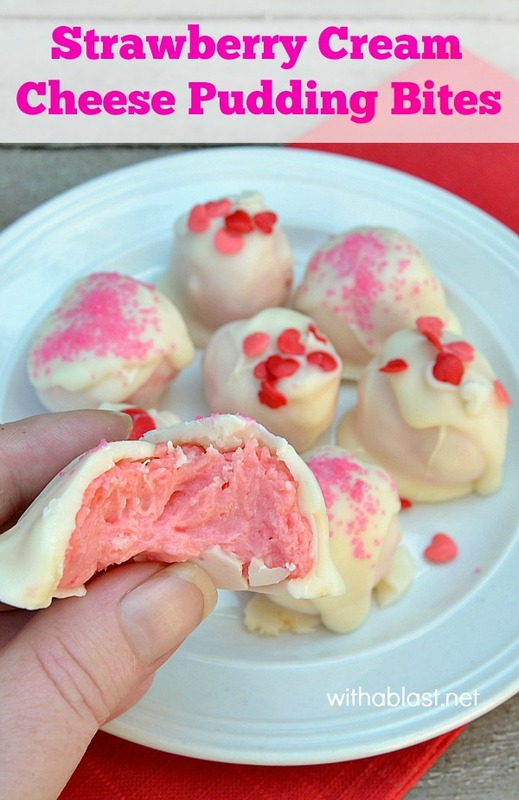 In the photo above I am squishing the Strawberry Cream Cheese Pudding Bites a little – see how the filling almost looks gooey… well, to be honest it is a little gooey, but only slightly, not the chewy kind of gooey. You can easily double the recipe which will then yield 30 servings, especially if you do not want to only use half a box of Instant Pudding. Seeing as I cook/bake and make treats for only 2 of us mostly, I have lots of half boxes/packets of this or that ingredient. Keep in a sealed container in the refrigerator for up to 3 days. What a pretty Valentine's treat! 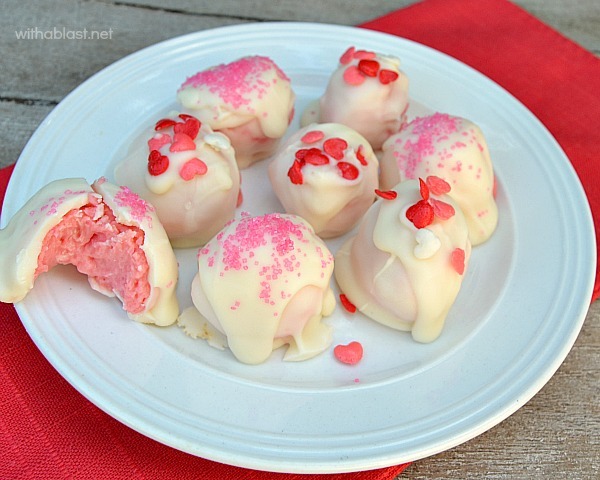 This sounds a a perfect Valentines dessert idea! 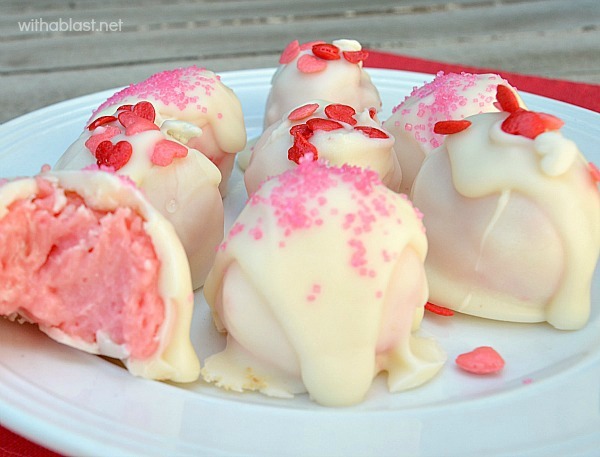 Love white chocolate!